Are you experiencing an acute discomfort in the eye quite often or experiencing halos around lights during night? You could be suffering from Pigment Dispersion Syndrome. Read and know all about the causes, symptoms, diagnosis, and treatment of this syndrome. It is a rare ocular condition that usually leads to a form of glaucoma known as Pigmentary glaucoma (PG) where the optic nerve is nearly damaged, causing visual loss. It is considered as an autosomal dominant disorder and is often denoted as PDS. It is a gender-specific syndrome, largely affecting the male population. Men are 3 times more susceptible to this disorder than women. It usually occurs between the ages of 20-45 years and affects 2.5% of the white or Caucasian population. PDS is estimated to develop into Pigmentary glaucoma in about 30% of cases. In normal cases aqueous humor is absorbed by the cornea of the eye, which in turn is ejected by the corneal endothelium. It generally functions like this in order to maintain optical transparency. Individuals affected with PDS have a dysfunctional corneal endothelium that leads to excessive accumulation of fluid in the cornea, causing acute swelling. Short episodes of eye discomfort and pain, that are generally subtle, often occur in patients. In some cases, however, these can be very distressing. Patients may experience sharp pain in and around their head that could be related to ocular pain. Cloudy or blurred vision may cause visual distortions in patients. Patients often see colored rings around artificial lights like car light or street light during night. Abnormality in the cornea is the main cause of this unusual symptom, causing poor night vision. It generally occurs when pigment granules that adhere to the back of the Iris (colored part of eye) form into flakes and fall off into the clear fluid inside the eye known as aqueous humor. These granules normally float freely inside this fluid. But in certain circumstances, they flow towards the drainage channels of the eye known as trabecular meshwork and clog them. This in turn prevents the aqueous humor from draining, thus increasing the pressure inside the eye known as intra ocular pressure (IOP). The exact etiology of this syndrome is still unclear as it affects only a small percentage of the population. Some theories have been postulated by medical experts that could help in the treatment process. Jogging, running and playing basketball are some of the vigorous activities that may cause more pigment cells to release from Iris. This can further block the aqueous humor drainage, generating acute intra ocular pressure inside the eye. Pigmentary glaucoma develops when IOP is very high, leading to irreversible visual loss as experienced in other forms of glaucoma. Mutated gene, responsible for the release of pigment from the Iris, often plays a role in the development of PDS. The inheritance pattern is autosomal dominant where one of the parents is affected with this syndrome and passes the mutated gene to their children. In this way, it is passed down from generation to generation causing PG in some patients. Patients who are myopic (shortsighted) demonstrate Iris concavity that makes the posterior surface rub against the anterior lens zonules bundles (fibrous strands) during movement of the pupil. Flexibility of the eye lens is usually maintained by a small ring of smooth muscles with the help of zonules bundles. The pigment cells get disrupted due to this continuous mechanical rubbing or insertion of the posterior iris and releases a large number of pigment granules. Blinking is believed to be responsible for causing concave configuration of the Iris. 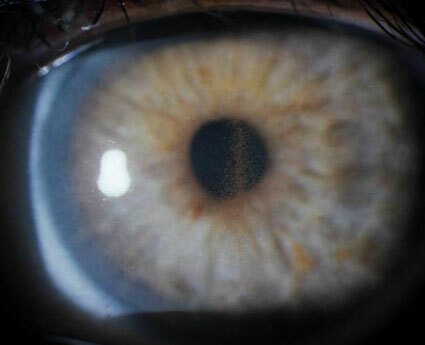 Increased loss of the Iris pigment often occurs due to flattening of the curved posterior surface of the cornea. It particularly affects those patients who are hyperopic (farsighted). The condition also arises when large amounts of released pigment get deposited in the trabecular meshwork, located near the cornea, which drains the aqueous humor into the blood from the eye. In this way, the intraocular pressure starts building up in the anterior chamber of the eye causing severe cases of glaucoma. In most cases, patients with PDS do not experience immediate symptoms that may often go undetected. Physicians may notice signs of pigment loss during an eye exam. Further diagnostic tests are conducted on the basis of these symptoms. Patients are asked about any cases of previous eye trauma, surgery or disorder. Visual symptoms are usually absent in this condition and are difficult to identify except in those cases that involve visual loss. In this method, a low-power microscope (combined with a high-intensity light source) is used by physicians to examine the front parts of the eye, including cornea and Iris. Here, the pigment is arranged in the shape of a Krukenburg spindle on the posterior surface of the central cornea. Krukenburg spindle is a vertical spindle-shaped structure that leads to opacity of the cornea. However, it is not always specific to PDS and could be associated with other conditions, such as Uveitis and trauma. 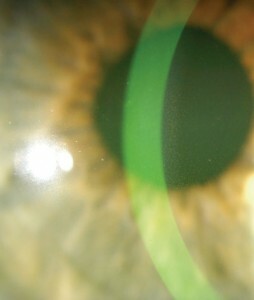 Pigment deposition may also occur in another pattern along the lens zonular fibers and is known as Zentmayer ring that may differentiate it from other similar conditions. It is a type of ultrasound imaging of the eye that can fully assess the extent of the Iris concavity. In patients with PDS, there is a posterior bowing of the peripheral iris that mechanically rubs against radially oriented lens zonules. Areas of pigment loss appear as bright spikes, resembling the spokes on a bicycle wheel in the mid-peripheral region of the Iris. It is best examined by physicians prior to pupillary dilation by directing a small slit beam on the Iris in a dark room. It is a high-resolution OCT that gives a cross-sectional and three-dimensional imaging of the cornea and the anterior segment of the eye. It is used for visualizing and measuring the anterior chamber of the eye that appears narrow in this case. Here, unilateral dense annular pigmentation of the posterior lens capsule can be observed. It describes the use of an instrument, Gonioscope, along with a slit lamp or microscope to measure width of the angle between the cornea and iris known as iridocorneal angle. It uses a mirror or prism to overcome total internal refection from the adjacent eye tissues and to permit visualization of the angle. It reveals a narrow angular width suggesting blockage in the trabecular meshwork, affecting the drainage of the aqueous humor. The width is dependent on the visibility of the ocular structures above the rim of the Iris. Wider angle indicates maximum visibility of the structures. In case of PDS, most of the structures are not visible. Hence, they appear narrow. There are some therapeutic techniques that are extensively used by physicians in order to reduce Iris concavity and intraocular pressure associated with this disorder. Eyedrops such as Betagan, Timoptic, Optipranlol and Xalatan, that have low incidence of side effects, are generally administered to the younger population suffering from PG. Topical miotics such as Pilocarpine solution, Pilocarpine ointment and Ocusert are normally recommended as a first line of defense. These medications help the pupil to constrict and lower the IOP, preventing further release of pigment. However, side effects like blurred vision have limited their use and have been replaced with topical prostaglandins, beta-blockers, and carbonic anhydrase inhibitors. Argon laser trabeculoplasty is a common surgical method that uses an argon laser beam to burn blocked areas of the trabecular meshwork. In this procedure, the clogged drainage system in the eye gets opened up, increasing the fluid outflow. This in turn lowers the IOP, preventing further damage to the optic nerve. Laser iridotomy is another treatment procedure, generally used to reduce iris concavity in patients with PG. Here, a laser beam is used to create a hole in the Iris to allow aqueous humor to flow between the anterior and posterior chambers of the eye. In this way, the Iris gets flattened, reducing complications related to high IOP. Pigment dispersion syndrome is a benign condition and not everyone with this syndrome develops pigmentary glaucoma. It is a curable condition, provided an early diagnosis is done in time. Regular eye examinations and medication can always prevent the onset of pigmentary glaucoma.